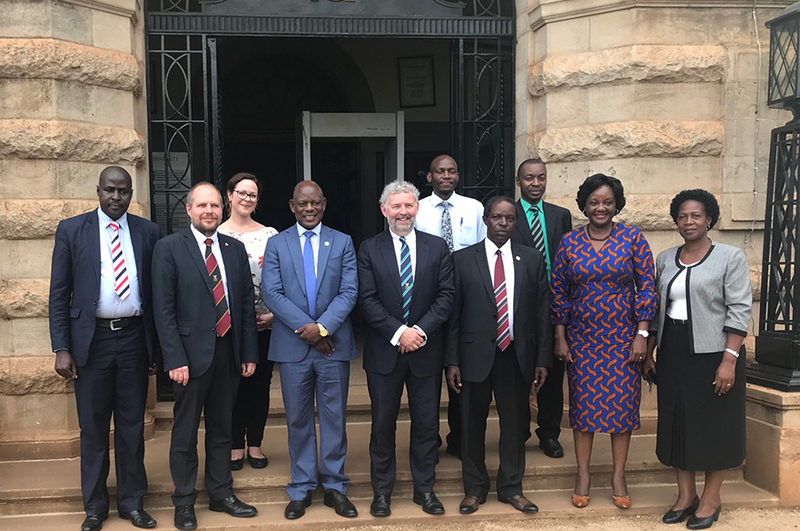 Nottingham Trent University is delighted to have expanded the collaboration with Makerere University (MAK) in Uganda following the signing of a University-wide Memorandum of Understanding (MoU) between the two institutions on Friday 4 May 2018. The collaboration has grown from a partnership of almost 10 years between NTUs School of Social Sciences and the Makerere University School of Public Health (MakSPH). In this time Dr Linda Gibson (NTU) and Dr David Musoke (MakSPH), who fostered the initial link and who have nurtured the partnership over the past decade, have secured ongoing project funding to support their work on strengthening the community health workers training programme in the Wakiso district of Uganda. This project has a big impact on the local primary health care system and is now being scaled up. The funding received has grown from an initial start up pot of just £5,000 through the Department for International Development (DFID) and the Tropical Health and Education Trust (THET), to further support for many other research activities, conferences and staff exchange. With additional input from the School of Social Sciences supporting these activities, including student placements. More recently the partnership are key members of the SPICES project, an EU Horizon 2020 multi-country consortium of six (6) Universities, on cardiovascular disease prevention, where funding of €6 million over the next five years has been secured. Over the past year further connections have been made with Makerere University in the areas of Law and Gender Studies, and it is hoped that the expansion of the MOU will now help facilitate even more research links across the University. The formal signing event, which took place at Makerere University in Kampala, was a great way for senior management to consolidate this long standing partnership and give their seal of approval for all the hard work that colleagues have put in over the last 10 years.